SCE employees take part in a Habitat for Humanity build on Veterans Day. SCE employees take part in a Habitat for Humanity LA Veterans Build home project. For Yolanda Hunter, Veterans Day hits close to home. Her father served in the U.S. Army in Vietnam and her brother is in the Navy now. So, the Southern California Edison project manager jumped at the chance to volunteer Wednesday for the Habitat for Humanity Greater Los Angeles Veterans Build project. Hunter and her SCE co-workers joined military veterans and other volunteers that day to begin framing three Habitat houses in Inglewood. One of the homes will be designated for a veteran homebuyer. “It’s Veterans Day — what better way to support veterans and those who put their lives on the line every day?” Hunter said. Erin Rank, president and chief executive, noted that veteran households pay more than 30 percent of their income for housing, creating a major need for affordable options. 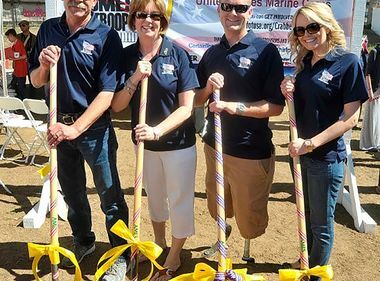 “This year’s Veterans Build is about thanking veterans and active military for their service, as well as exposing them to the great work we are doing through our Habitat for Heroes program,” Rank said. Established in 2011, the goal of the Heroes initiative is to create affordable housing solutions and volunteer opportunities for veterans, active military and their families. 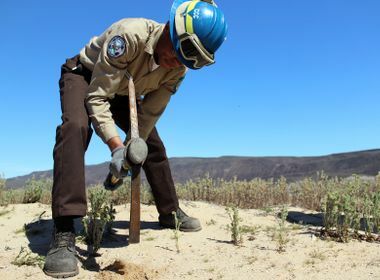 Jim Anderson, an Army veteran and one of the other members of the SCE Valor employee resources group participating Wednesday, said he is happy to volunteer on what otherwise would be a day off. 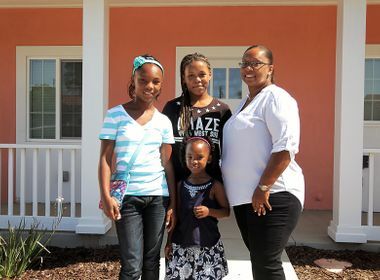 “It’s an opportunity for me to make a small contribution, to have an impact on someone else’s life,” said Anderson, an SCE Corporate Events program manager and longtime supporter of Habitat. In addition to the employee volunteers, Edison International, parent company of SCE, donated $40,000 for the Hyde Park project. The Habitat project will expand an existing 984-square-foot home by adding a second story and a two-car garage. Two new homes also will be built on the 7,500-square-foot lot. “Green building” will be incorporated into each home and will include energy-efficient lighting, heating and cooling systems as well as Energy Star appliances. The houses will also be solar ready. Grid Alternatives, a nonprofit that brings together community partners, volunteers and job trainees to implement solar power and energy efficiency for low-income families, will supply the solar panels when escrow closes on the new homes.